This article series explains a simple procedure using string and a measuring tape to measure the amount of leaning, bowing, or bulging in a cracked, bulged, or tipped building foundation wall or in any other building wall or vertical surface. This is chapter of "How to Evaluate Foundation Cracks" which is part of "the Foundation Crack Bible" website. This document describes how to recognize and diagnose various types of foundation failure or damage, such as foundation cracks, masonry foundation crack patterns, and moving, leaning, bulging, or bowing building foundation walls. The photo at the top of this page shows a bulged masonry foundation wall which has also been cut and interrupted to make a doorway. The measuring tape set vertically against the wall can show that the wall is not straight (the tape is straight) but this is not the best way to measure the amount of bulge or lean in a foundation wall, because without a plumb line we don't know that our tape is perfectly vertical. In detail below we describe the proper way to measure foundation movement. Measuring foundation wall tip, lean, or bulge: is simple: drop a plumb line near the most-bulged area (usually the center) of the wall, perhaps fastening it to a nail in a floor joist overhead, about 4" in from the wall. Measure from the string in to the wall at various heights up the wall. You'll be able to easily pinpoint the height of the most bulge or lean. This is not engineering. 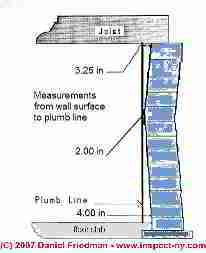 It's simple a simple mason's method to measure a wall or chimney during construction to keep it plumb. You may need to hire the services of a licensed professional engineer, [make certain that your engineer is experienced with foundation troubleshooting and repair], especially if there is need to design a special building repair method or if there is apparent risk of possible building instability or collapse. Wall most-bulged in near the outdoor ground surface (commonly occurs in the upper 1/2 of the wall), perhaps at a depth equal to the frost line in climates where freezing occurs or in the top 1/3 of the wall if we suspect water or frost loading on the wall, or possibly vehicle traffic driving too close to the wall. Wall most-bulged in near its bottom (unusual) - we suspect earth loading or wet earth loading. A plumb line, is simply a string suspended by a weight, so as to give a perfectly vertical line from which to measure back to the wall surface. We drive a nail into the side of a floor joist or into the sub floor overhead, in the ceiling over the room where we're working, typically a basement or crawl space. Quiesce the plumb line, that is, make sure that it has stopped swinging or moving, before making your measurements of the foundation movement. A tape measure or yardstick or ruler is used to measure the distance from the face of the wall to the closest surface of the vertical plumb line. We measure at multiple locations from the floor up to the top of the wall, writing them down in order and perhaps even making a pencil number on the wall too, so that we can identify just which part of the wall is pushed inwards or leans over the most. We subtract the individual measurement amounts from our "home base" starting measurement, at a point on the wall where there has been zero movement, usually at the very bottom of the wall. We don't care about the absolute value of the various measurements, we care about the difference between these measurements. Our base reference point for comparing measurements is normally the bottom of the wall. Usually the very bottom of a building wall will not have moved inwards, particularly if a concrete floor has been poured against the foundation. The entire building floor slab is acting as an "anchor" to hold the bottom of the foundation wall in place. So we take the distance between the foundation wall and the string at the bottom of the wall as our "home base" or point of assumed "zero movement". We compare this measured value with the other measurements between the wall and the string. If the foundation wall or any part of it higher than the level of the floor has moved, tipped, or bulged inwards, those measurements from wall-to-string will be less than the distance, wall-to-string measured just above the floor level. That's because the wall has moved inwards, towards the string. We compare our measurements to recommended standards of amounts of wall movement in order to form a general opinion about whether expert analysis or repair are probably needed. We have found no nationally accepted standard or opinion for just what these numbers need to be, probably because some judgment is needed about particular site conditions. For example, a small amount of movement that is new, in an old foundation wall that had not previously moved, might be significant. See some collected opinions about "how much foundation movement is a worry"
We measure 3.25 inches from the same foundation wall surface to our vertical string at the very top of the wall just under the sill plate.
. If the distances we measure, wall to string, are greater than the distances we measured at our first trial, then that one is the point of greatest inwards foundation wall bulge. Finally we do the math: subtract our "higher on wall" and "closer to string" measurements from our "at the floor" and "farthest from string" measurement. If all of our measurements of inwards movements in the foundation wall increase in distance (wall to string), from floor up towards the top of the wall, the wall is leaning inwards. In this case we'd expect to not see horizontal cracks (if the wall is masonry block, for example). 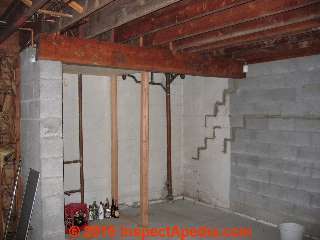 Watch out, in some cases a foundation wall may not lean in the direction you expect. For example a reinforced masonry block wall or poured concrete wall which has been pushed inwards by earth loading might move inwards at the bottom of the wall rather than at the top. The bottom of the wall will have been pushed in to the building basement or crawl space and the top may actually begin to lean out and may even become visible outside, protruding out past the building framed wall. If our measurements anywhere between the floor and the top of the wall is greater than the distance measured (wall to string) at the floor bottom and at the wall top then the wall is "bulged" inwards at that point. If the wall is masonry block in construction we'd expect to see horizontal cracks in one or mortar joints in the bulged area, with the widest horizontal crack at or close to the point of greatest inward bulge. Why distinguish between leaning and bulging foundation walls? We care about the distinction between leaning and bulging because understanding the location and pattern of foundation wall cracking or movement may help us diagnose its cause and thus may help us understand what actions are needed to stop further foundation movement or perhaps to decide on a course of repair or reinforcement of the wall. For example, recognizing that a foundation wall has bulged inwards at about the depth of the frost line at a building may tell us that the root cause of that particular foundation movement was frost pressure from spillage of roof runoff too close to and along the building wall. 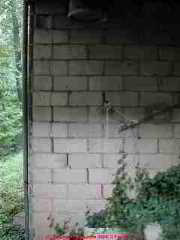 Even a concrete wall which is bulged is likely to be cracked horizontally, though perhaps not in such a straight line. But a bulged reinforced concrete wall would be very rare unless perhaps the concrete wall bulged, or its forms bulged, during the time that the concrete was being poured and was still wet. It's more likely that a reinforced concrete wall will be caused to lean or to shift horizontally while a masonry unit wall or stone wall is likely to be bulged and cracked by the same external forces. On less frequent occasions we've found that an entire masonry block wall (or portions of it) were pushed horizontally inwards by some outside force, without causing the wall to lean or bulge. In the photograph here we suspect that the cracks in this masonry block wall occurred as a defective wall footing began to creep down a steep hill behind the building. In a pure example of horizontal creep or movement without leaning in a masonry wall or foundation, all of the differential movement measured (wall to string) between the wall bottom point (held in place by the floor slab) and the inwards-pushed wall section, will be a horizontal movement of that portion of the wall, and if it's masonry block, you'll see that the inwards-moved blocks are "hanging over" or projecting past the surface of the masonry blocks that did not move. 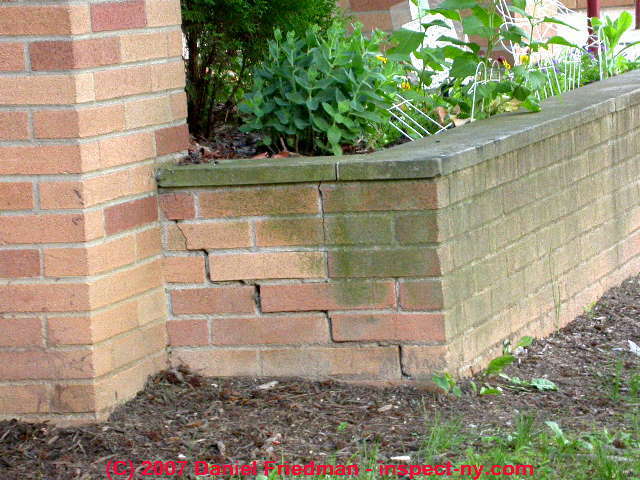 Other vertical cracks can occur in a masonry block or concrete or brick or stone foundation wall without leaning or bulging if the entire wall is moving due to footing settlement or frost. Watch out: Beware of this condition: if the bottom of a wall is not pinned in place by a secure footing or a concrete slab, the entire wall, from top to bottom may move horizontally with no leaning and with no "overhang" of one portion of the wall over another. Impact damage from a vehicle or from unusual weather such as a hurricane which lifts and tosses large objects, can lead to severe foundation or masonry wall damage and may even render the wall unstable and unsafe. 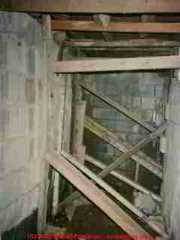 In the photograph shown here the cause of damage to the foundation wall is pretty obvious. Almost certainly a delivery truck has backed into this concrete block wall, perhaps even more than once. The damage to this wall was extensive, extending nearly to the top of the structure. The wall needs extensive repairs, probably reconstruction. Step cracks may also be present in bulged, leaning, or horizontally pushed foundation walls if they were constructed of brick or masonry block, or possibly (though less common) of stone. 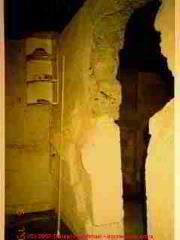 In fact since the building foundation corners are stronger than the center portions of the foundation wall (the opposing wall at right angle resists movement of the wall being pushed), wall bulges, leans, and cracks tend to occur towards the center of the wall, resulting in step-cracking closer to the ends of the same wall. In the photograph above, frost push has bulged the center of the foundation wall inwards; as the forces of wet earth and or frost pushing on the upper 1/3 of this foundation wall were applied at the center of the wall, the wall bulged inwards and cracked horizontally at the point of most pressure. 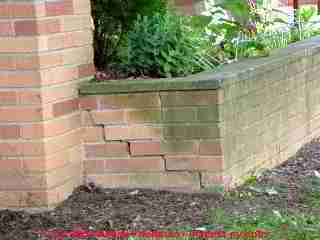 As the same forces causing this wall to bend were exerted closer to the building corners, the wall cracked in the step-crack pattern clearly marked in this picture by the "repairs" which have been done by filling the cracked joints. If the total amount of wall movement was minor and if the outside source of pressure (water and frost) has been corrected, further repair or reinforcement may not be needed. 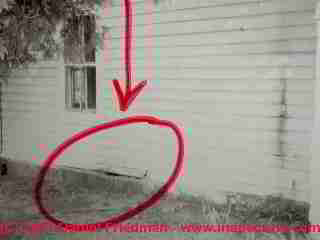 Horizontal wall movement and masonry block "overhang"
Inspectors or building owners may also encounter a foundation wall which has moved inwards in a combination of forms, both bulging at its most-pushed-in point (with horizontal cracks in the foundation wall) and the wall may have also been pushed inwards sliding some of the masonry blocks inwards past others which have remained in place. In this case you'll see both that some masonry wall blocks will overhang or protrude past others in the wall (usually upper inwards pushed blocks hang over lower more stable blocks closer to the floor), and there may be bulging and cracking at another elevation of the wall. This is a photograph of frost push and horizontal overhang or sliding between horizontal courses of a masonry block wall. Other step cracks will of course also occur in building masonry block foundation walls and in brick masonry walls that are not leaning or bulging particularly, where frost or settlement have been causing an "up and down" movement in the foundation or footing. We will also encounter step cracks where earth pressure or frost have pushed such a wall horizontally, breaking the masonry courses near a corner or wall-end in a stair-step pattern such as we see in this little example of water and frost damage to a brick retaining wall. Continue reading at BULGED FOUNDATION REPAIR METHODS or select a topic from closely-related articles below, or see our complete INDEX to RELATED ARTICLES below. 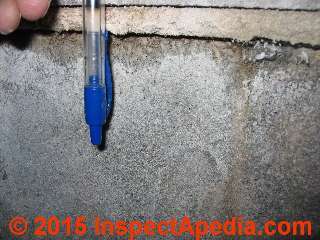 BULGE or LEAN MEASUREMENTS at InspectApedia.com - online encyclopedia of building & environmental inspection, testing, diagnosis, repair, & problem prevention advice. Straw bale houses are easy to build, affordable, super energy efficient, environmentally friendly, attractive, and can be designed to match the builder’s personal space needs, esthetics and budget. Despite mushrooming interest in the technique, however, most straw bale books focus on “selling” the dream of straw bale building, but don’t adequately address the most critical issues faced by bale house builders. Moreover, since many developments in this field are recent, few books are completely up to date with the latest techniques. More Straw Bale Building is designed to fill this gap. 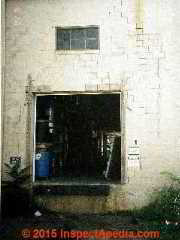 A completely rewritten edition of the 20,000-copy best--selling original, it leads the potential builder through the entire process of building a bale structure, tackling all the practical issues: finding and choosing bales; developing sound building plans; roofing; electrical, plumbing, and heating systems; building code compliance; and special concerns for builders in northern climates.